Kings Crown Glass - Indiana Glass Co. - 7292 - Wedding Bowl, 5", 5 In. high; 1 3/4 In. deep; 5 In. diam. The stem quality on these can range greatly. Although we've provided a generic image of a very clear stem, many of the full color examples have stems which significantly lack clarity and definition, with a "melted" quality about them. 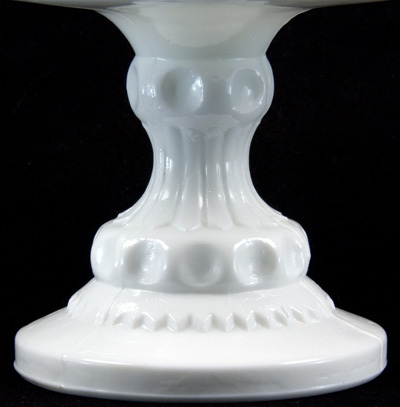 The tall rimmed milk glass example is the only color offering we have see at that extended height. Wedding Bowl, 5" , 5" high; 1 3/4" deep; 5" diam. Stem is hollow up to the top of the first thumbprint band. Quality significantly differs between pieces, with some having crisp definition, and other a "melted" quality. Note the derived draped panel section similar to the XLCR large stems.